Compact and handy RFID reader with Bluetooth* for animal identification. The portable readers AGX350 and AGX380 combine an ISO 11785 RFID reader and an alphanumeric keypad for easy data collection and are nevertheless so small that they fit even into a shirt pocket. The IP64 housing of the AGX350/380 is very handy and easy to operate even under worse conditions. The FLASH memory capacity of 5000 IDs is sufficient for more than a days work. The data are protected even when the battery fails. 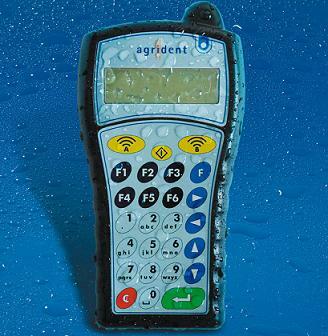 *The AGX380 has an additional Bluetooth Class 2 interface. The Reader is compatible to the ISO Standard 11785 and read FDX-B and HDX tags with good reading range. Tags with the widely used chip type H4002 can be read optionally. Downloadable user-defined action codes can be combined with values via the keypad. The action code can be either a number or free programmable alphanumerical text. With the “Action code plus” function, an additional value, can be saved. A look-up table can be downloaded to show animal live numbers or farm numbers additional to the transponder ID. With the ASSIGN function the animal ID and the transponder ID can be assigned in the field. The animal ID can be added from a downloadable list or the keypad. The two HOTKEYS of the AGX 350/380 can be programmed individually and combined with a special action code to make recurrent work more convenient. With the optional TASK mode user-defined configurations are possible. The large FLASH memory is sufficient for 5000 IDs, including Alias (e.g. animal ID), time stamp and action code which is protected if the battery fails. Due to the handy design and the pocket size of its robust IP 64 case the reader is very comfortable even under worse conditions. The large backlit Display has 2 x 16 Characters and is very readable. An ergonomic mobile phone style Keyboard with 26 Keys ensure easy and comfortable operation. The AGX 350/380 can be used with an external antenna like the AEA080 stick antenna. The AGX 350/380 is prepared for data communication, power supply and recharge via the APC200 USB cable or the optional USB docking Station ADS200. For convenient power management the AA type batteries can be replaced, a car adaptor for recharge is available. The AGX 380 has an additional integrated Class 2 Bluetooth module that enables wireless communication with computers up to 10 m.